Wooden Inlay Silver Wedding Ring : LOVE2HAVE in the UK! This flat profile wooden inlay silver wedding ring is the matching thinner version of the wider model listed in this section. It measures a total width of 5mm. 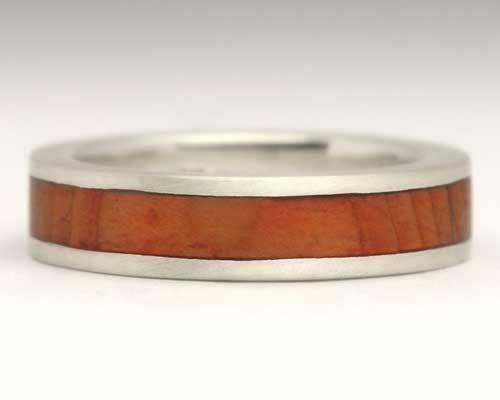 It is a flat profile style ring set with a wooden inlay set centrally into the band. At approximately 5mm wide it is suitable for everyone and makes an excellent choice for a women's wedding ring with its wood and silver two-tone look. It comes inlaid with Oak that measures 3.2mm wide. We have chosen Oak as it is known to be a very durable type of wood. The silver is matte in finish, and the inner is polished and therefore very comfortable. The fitting of it is a comfort one, meaning it is slightly curved and glides nicely onto the finger. When bought together with the wider version they make a very unusual wedding ring set, and the silver is beautifully finished to match the wider version.